Mesh net interior w/ elastic band for fitting. Let us break it down for you, pal: A properly combed, high coif basically gets a guy anything he wants. Wanna know why? Because walk into any room and you'll find that a luxurious head of male hair tells everyone, "Yeah, that's right...I don't have to worry about early-onset hair loss or male pattern baldness, so I have much more time to devote to leisure activities...like speed boating, or rare jewel prospecting." And we don't have to tell you that the ladies love a thick mane of male hair...look at Barbie's boyfriend Ken, for instance. You think a guy like him would score a babe like that with a crew cut? Not on your life! High hair makes people think that you're the distant heir of a royal Greek family, or that you're about to inherit millions of dollars from your hotel-chain-owning grandfather. Why? Who cares! We just know that it does, and that's good enough for a successful Jet Ski salesman like ourselves, it should be good enough for you! And as any prominent, top salesman of recreational water toys knows, in order to be successful, you must first present an image of success. 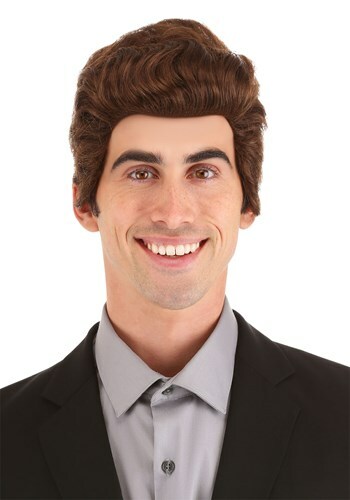 So take this hot tip and run with it by elevating your game with this Brown Salesman Wig. Slip it on, and watch it take you to the big time, brother!